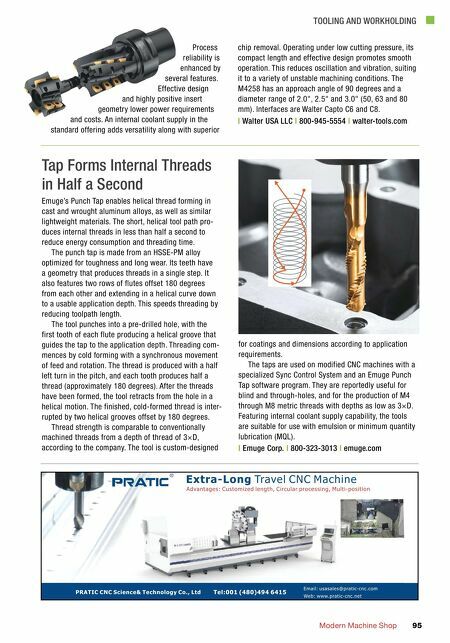 TOOLING AND WORKHOLDING MMS DECEMBER 2018 94 mmsonline.com Jaw Nuts Minimize Jaw Change Time Dillon Fast-Trac jaw nuts are designed to convert standard chucks into quick-change chucks, reducing jaw change time by as much as half. This system is said to enable users to pre-assemble the next operation jaws while the machine is run- ning a separate job, thus minimizing jaw change time and maximizing productivity and profitability. Dillon jaw nuts, T nuts and keys are available to fit power chucks from 6" to 24" in diameter, including Forkhardt, Gamet, Howa, Kitigawa, Matsumoto (MMK), Nikko, Pratt Burnerd, Röhm, Samchully, Schunck, SMW and more. They are ideal for workholding applications requiring durability and high strength such as high-speed machining, according to the company. Dillon also offers a special T-nut design and manufacturing service for custom workholding requirements. 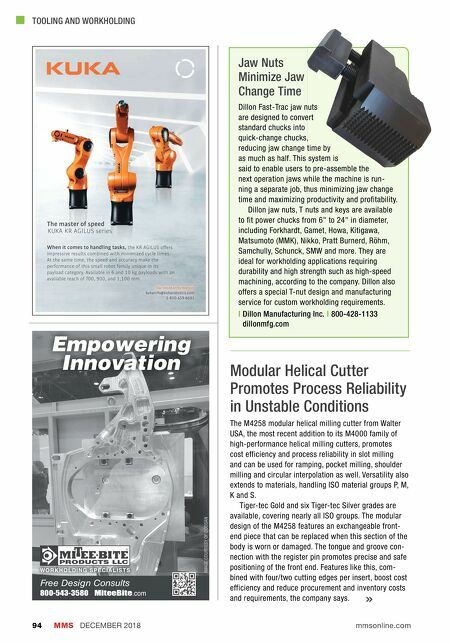 | Dillon Manufacturing Inc. | 800-428-1133 dillonmfg.com Modular Helical Cutter Promotes Process Reliability in Unstable Conditions The M4258 modular helical milling cutter from Walter USA, the most recent addition to its M4000 family of high-performance helical milling cutters, promotes cost efficiency and process reliability in slot milling and can be used for ramping, pocket milling, shoulder milling and circular interpolation as well. Versatility also extends to materials, handling ISO material groups P, M, K and S. Tiger-tec Gold and six Tiger-tec Silver grades are available, covering nearly all ISO groups. The modular design of the M4258 features an exchangeable front- end piece that can be replaced when this section of the body is worn or damaged. The tongue and groove con- nection with the register pin promotes precise and safe positioning of the front end. Features like this, com- bined with four/two cutting edges per insert, boost cost efficiency and reduce procurement and inventory costs and requirements, the company says. Free Design Consults 800-543-3580 MiteeBite .com W O R K H O L D I N G S P E C I A L I S T S Empowering Innovation IMAGE COURTESY OF DOOSAN The master of speed � KR AGILUS series When it comes to handling tasks, the KR AGILUS offers impressive results combined with minimized cycle times. At the same time, the speed and accuracy make the performance of this small robot family unique in its payload category. Available in 6 and 10 kg payloads with an available reach of 700, 900, and 1,100 mm.